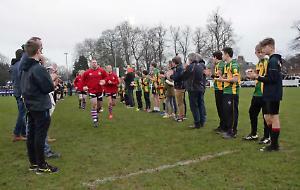 HENLEY put in a spirited display to draw with London Wayfarers at Jubilee Park last Saturday. Despite conceding the first goal after 10 minutes, the hosts dominated much of the first half and equalised through Luke Gupta, after Henley captain Ed Foster’s astute reverse stick strike was parried by the visitors’ goal keeper, but Gupta was on hand at the far post to deflect the ball into the corner of the goal. The home side doubled their lead through Tom Walter, who found himself in space in the Wayfarers D, and despatched a well-taken drag flick past into the corner of the net. Despite chances at either end of the pitch, the score remained 2-1 to Henley going into half-time. In the second half Henley played some good hockey and added their third goal on 45 minutes. Following some determined play from Jonny Taylor down the left wing, the ball fell to Foster in the Wayfarers D, who slid the ball past the goalkeeper, for Steve Harding to pass the ball into the unguarded goal. At 3-1, Wayfarers changed their formation to three in defence, which allowed four high forwards to apply pressure to the Henley back line. With 15 minutes of play remaining the visitors pulled a goal back after a scrappy long corner fell to the Wayfarers’ centre forward, who drilled the ball past the helpless Roy Cox in goal. Minutes later the scores were level, after a broken down short corner resulted in a penalty flick being awarded after Robbie Mortimer was adjudged to have fouled a Wayfarers attacker on the goal line. Alex Penney stepped up for the away side and made sure that the points were shared, as his flick nestled into the corner of the home side’s goal. Despite being unable to hold on for the win, Henley will be buoyed by their strong performance and will hope to replicate such displays in the second half of the season and move up the league table. HENLEY 3rds lost 2-0 at home in a tight battle with fellow promotion contenders Aylesbury 2nds. The hosts boasted a strong side but struggled to develop their normal fluency under the floodlights at Jubilee Park on a bitterly cold day. the corner of the Henley goal. Galvanised by this, the home side pushed higher up the pitch and built more attacking moves, winning a series of penalty corners which went unconverted. Winning their own penalty corner following a fast break, Aylesbury doubled their lead with a sharp straight strike. With 10 minutes remaining Henley continued to press and build dangerous moves, but none were converted. Henley end the first half of the season in third place in the league, just three points behind the leaders. HENLEY 5ths’ Andy Farrow netted a hat-trick as the amber and blues defeated Witney 5-1 at Jubilee Park. Henley were on the offensive from the start, pushing up into Witney’s half and creating an opportunity for centre forward Farrow to open the scoring. Stepping up the pressure against Witney, midfielders Max Hems and Henry Davis once again took the ball up in to Witney’s 25 yard area and a concise pass via Alan Mortimer was fed in to the D and expertly dispatched into Witney’s goal by Farrow. Henley made it 3-0 when centre back James Moore charged up through the midfield culminating in a concise and accurate strike into Witney’s goal. Witney upped their pace in the second half and came back with a couple of fast charges on Henley’s goal that were seen off by goalkeeper Joe Selvester and fullback Nick Shuttleworth. Despite their best defensive efforts Witney eventually managed to score to reduce the arrears to 3-1.
game when centre-forward Farrow completed his hat-trick.